Chinese Welcome Easing Of One-Child Policy, But Can They Afford It? : Parallels Demographers say China needs more children because the country is aging and the workforce is shrinking. But raising kids costs so much these days that many parents are expected to forgo the option of having a second child. 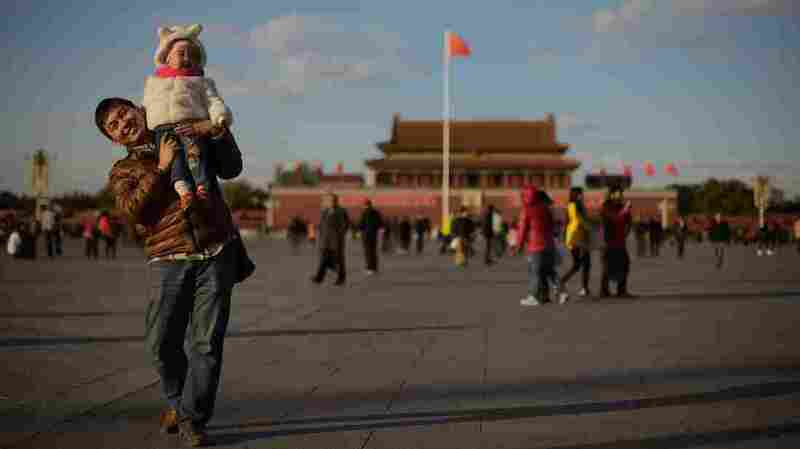 A man and child walk in Beijing's Tiananmen Square. China's government recently announced an easing of the country's one-child policy. While the move appears to be broadly supported, many urban Chinese parents say it would be hard to afford a second child. Many Chinese are pleased with the recent announcement that their government will further loosen the country's one-child policy. Some couples there are already allowed to have two children, while others say that even if they are permitted to have another kid, they can't afford it. A young, professional couple surnamed Gao and Deng went to a government office in Shanghai earlier this month to apply for a marriage license. Waiting on a metal bench, Gao, the 30-year-old groom-to-be, said he was glad more couples will be able to have a second child. "I think for people like us who were born after 1980s, this is a very good policy change," Gao said. "Now, if families are financially capable and conditions allow, they should totally have two children." Deng, the bride-to-be, who wore a long pink dress, said the couple hopes to have two children. "They can help each other and grow up together," she said. "When we get older, they can take care of each other." In fact, Deng and Gao are already permitted to have two children. More than a decade ago, the government began allowing couples to have two kids if both parents were only-children. It's a reminder that China has been easing its one-child policy over the years. Officials took a further step in that direction this month, announcing that if just one parent is an only child, a couple can have a second child as well. That's an incremental change, but many see it as progress after years of lobbying. Wang Feng, a leading demographer in China and a sociologist at the University of California, Irvine, has spent more than a decade urging Chinese officials to change the one-child policy. Until relatively recently, he said, the topic was too sensitive for public discussion. "Three years ago, I was turned away from a television studio minutes before they were going to discuss this in their evening program, because of orders from the state news control organization," Wang said from his office at Shanghai's Fudan University. Wang credits this month's policy change to a new, more confident group of Chinese leaders who took office earlier this year. He said they seem to recognize the policy has created big demographic problems in China, including a rapidly aging society and a shrinking labor force. The policy is also very unpopular among ordinary Chinese. It has led to abductions of would-be mothers, forced abortions and cost Chinese parents more than $4 billion in fines last year alone. "This is an important gesture," Wang said. "The government is getting out of our bedroom, and also, the government is finally reacting to the decade-long appeal from all different ranks in society to phase out an obviously outdated policy." Estimates vary, but Wang thinks the policy change will apply only to about 10 million couples — small by Chinese standards — and that most of them are unlikely to have a second child. Some are simply too old. For others, raising another kid is just too expensive. Yu Juxiang, a retired maid, is chasing her 2-year-old grandson around a Shanghai Toys R Us. Yu would like to have another grandchild, even though this one is a handful, but she said the extended family just can't afford it. "It's hard enough to raise one child," she said. "He's still little. Every month, we spend $600 to $800 on him: baby formula, diapers, nutritional powder, fruits and so on. It's a lot of expense." Yu's son drives a taxicab and makes at most $820 a month in a city where home prices, already crushing, have jumped more than 20 percent since October of last year. According to Chinese custom, men must buy a home before they can marry. Yu wonders how her grandson will afford it. "When he grows up, he will have to find a wife, buy an apartment and a car," Yu said. "For boys, these things are non-negotiable. If you don't have money, you will need to borrow from other people in order to buy a home. The thought of buying a home really gives me a headache." Provincial officials will roll out the new policy over time. Wang, the demographer, expects it will result in just another 1 million to 2 million babies annually over the next several years.